It was dark and eerily quiet inside. In the dim light, I noticed a figure crouched over. Or was it standing? It didn’t look human. I heard a small noise, like a squeak. Over my head a creaky fan rotated slowly. And suddenly, bam, a group of little kids ran past shoving me. Here I was, at Colombo’s National Museum of Natural History. Hardly a prime tourist spot in the city, this is located on the same premises as the National Museum, but finding the entrance to here can be a challenge. 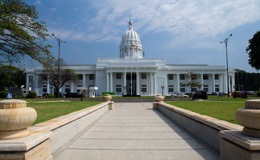 Most visitors tour the main building, which has the most well-known exhibits such as the Dutch-gifted throne of the last king of Sri Lanka and lovely watercolor paintings of Colombo before it was a sprawling metropolis. What I came here for however, was the little-known natural history museum. To get here, I had to walk around the main building, enter through a hobbit-like gate into a weedy garden with a shaky stone path. Of course, the natural history museum, which boasts of being the “only museum” in Sri Lanka to showcase the island’s “natural heritage,” is not at all a ritzy tourist attraction. In fact, it reminded me of the second grade museum tours at school. The building is old, tad bit dusty with the smell of old books. Hardly anyone ventures in here, so I could gawk at the exotic exhibits without annoying crowds. The very friendly staff here directed me to the topmost floor, where the tour begins with a mind-bending display of Sri Lanka’s millennia old irrigation systems. This floor is more modern and had TV screens and amazing models explaining how ancient peoples of the island engineered water reservoirs that last to this day. The second floor was even more fantastic. It was dedicated to showing the biodiversity of Sri Lanka. Once section was entirely dedicated to showcase pests. Yes, those buggers that destroy crops. They had teeny-weeny little insects skewered on pins like kebabs you wish you’d never seen. Another section displayed stuffed birds in glass cages placed in front of drawings of their natural habitats. I’d never seen an exhibit as informative and as disturbing as this one. Other sections had displays of beautiful sea shells and limestone formations. There's a room dedicated to “genetic diversity” with inkjet-printed notes of how DNA works. What mostly attracts people to this section is the entrance, which is decorated by a giant board with photos of different types of kittens. The best exhibit section is on the ground floor, where the tours typically end. This floor has the warped “taxidermy jungle,” where stuffed deer and peacocks are displayed behind glass enclosures as if they are still living in the jungle. Right outside here are walls lined with displays of stunning fossils collected on the island, including fossils of extinct elephants, lions and hippopotamus. The museum’s best exhibit is the one placed at the exit—a two headed goat preserved in a jar. Overall, Colombo’s Natural History Museum is unique that it’s not garishly designed to attract tourists, so I could enjoy an unexpectedly authentic museum tour, one of the best I had in Sri Lanka. Colombo 07 or Cinnamon Gardens as it is also known is one of Colombo’s plushest residential areas. The area gets its name from the large Cinnamon plantations that were in existence during the 18th century.